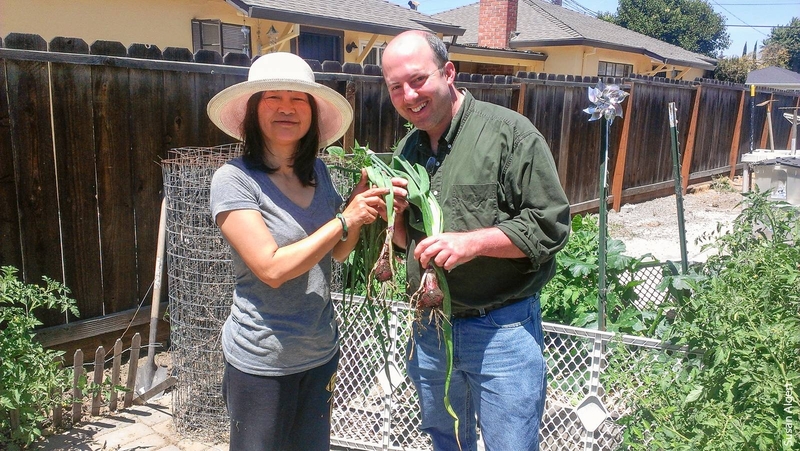 Rob Bennaton, right, UC Cooperative Extension urban agriculture advisor for the Bay Area, shows off freshly picked onions. Aspiring farmers are invited to apply for Urban Edge Sustainable Farming, a program that will expand the range of opportunities for beginning farmers in California by leveraging 550 acres of prime, protected East Bay farmland for training, farm business incubation and long-term leasing. As baby boomer farmers retire, a new generation of farmers is needed to carry on the work. First Generation Farmers received a grant from the USDA National Institute of Food and Agriculture Beginning Farmer and Rancher Development Program to launch Urban Edge Sustainable Farming as a formal training and incubator program that combines classroom-style instruction with hands-on field training. The program is designed to provide beginning specialty crop farmers with the core agricultural production skills, business knowledge and the confidence they need to establish viable farm businesses. Janet Caprile explains procedure for releasing parasitic wasps to destroy moth eggs. To provide science-based training, the women-led nonprofit farm located in Brentwood, 55 miles northeast of San Francisco, is partnering with UC Cooperative Extension in Contra Costa County. Urban Edge Sustainable Farming is a full-time, nine-month residency. In 2018, the course will run from Feb. 5 through Nov. 5, with a one-week break in early July. Beginning farmers will live on site in dorm-style housing for an immersive, cooperative learning experience. The curriculum is designed and delivered by First Generation Farmers and professional instructors from the National Center for Appropriate Technology and UC Cooperative Extension. Participants will also learn from working alongside the Cecchini family — successful, fourth-generation farmers who are bridging agricultural tradition with adaptation to 21st century practices and market demands. The training covers a wide range of topics, including composting, organic practices, greenhouse management, pest and disease management, healthy soil management, cover crops and crop rotation, biodynamic farming, crop planning, food safety and handling, marketing strategies, financial record-keeping and business planning. First Generation Farmers will introduce participants to regional direct and wholesale markets. “What UESF [Urban Edge Sustainable Farming] offers beginning farmers is unique in California: an opportunity to farm on historic farmland, in close connection with a traditional farm family, in a changing farming community on the edge of a major and expanding urban market,” said Poppy Davis, independent ag business and policy consultant and research professor at the University of Arkansas School of Law. Urban Edge Sustainable Farming is open to all applicants, but the program prioritizes admission for beginning farmers with limited resources, military veterans, and those from socially disadvantaged backgrounds, including women, members of the LGBTQ community, people of color, immigrants and refugees. Because a diverse population of farmers makes for a stronger and more resilient farming community, the program aims to support farmers who often experience significant systemic barriers to starting their enterprise. Up to 15 beginning farmers can be accommodated in the first cohort and applications will be accepted until the cohort is full. Applicants must be 18 years old and previous farm experience is not required. Tuition for the program is $4,000 and includes food and lodging. For more information and to apply, visit https://firstgenerationfarmers.org/uesf.